Official site of D & C Supply Co. Inc. The use of Flex-Ten® Stainless Steel Fibers in the reinforcement of refractory materials provides substantial increase in refractory life and therefore a considerable reduction in maintenance costs. Stainless fibers significantly increase the tensile strength of the refractory in its critical period and greatly increase its energy absorption capability. Though discontinuous, fibers act as a crack arrestor and form a mechanical bond after cracks may occur. 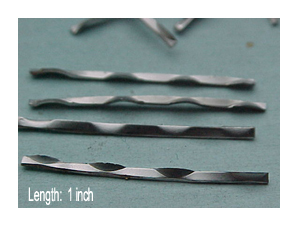 Stainless steel fibers greatly improve the flexural strength of the castable. This added increase in ductility contributes greatly to thermal shock and spall resistance. Flex-Ten® is a registered trademark of D & C Supply Co., Inc.